Every now and then you find a guesthouse where you really feel at home. Pedal Inn is such a guesthouse. Cycling is becoming more and more popular all over the world and also in Malaysia. Although infrastructural circumstances are by far not as good as they are in western Europe gradually more and more Malaysians take to the bike for excercise and for fun touring. In Georgetown on the island of Penang there's is a group of such bike fans and one of them is Steven. 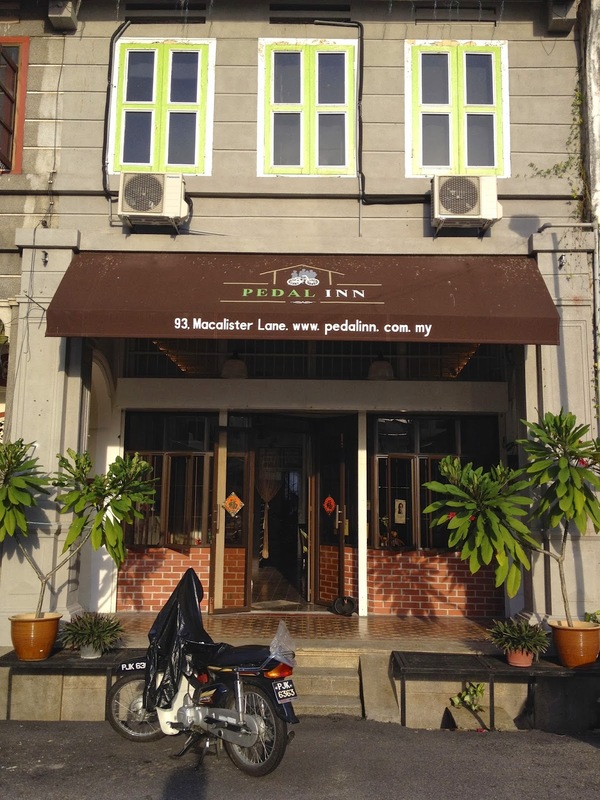 Steven decided 2 years ago to make it his living and opened a guesthouse in a rented old Chinese shophouse in Lorong Macalister in Georgetown. The house was redecorated and it is now a cosy and quiet place where you as a guest can be yourself and where Steven has created an atmosphere of a living room. Breakfast and coffee are free, cold drinks can be bought and Steven is always there for advice, for a chat and for serious discussions on all that keeps us busy. The neighbours walk in in the evening, as well as friends, and they all contribute to the homely ethos. The house has 3 4-person dorms and a room with a double bed. If the double is occupied cycling couples get a dorm for their own. Bathrooms are shared, there's a personal locker for each guest, everything is clean and tidy. There is place to park the bikes and there are tools and buckets for cleaning and maintenance. Food courts, the typical Malayan, but certainly Penang, way of having your meals, are close, as is the old historic centre. We came in as guests, we left as friends. Thank you for your kind words. How are you guys keeping? Are you still blazing new trails? Since last December, I've made a few changes to the inn. All rooms were transformed into private ones. I pretty much decided to go with more comfort and added space and we've also added another 2 boutique houses nearby. For those who do not mind splurging a little bit more on themselves, these 2 units offers total privacy and exclusivity. Frans, you and Eveline have probably seen the world by now. Is there any place left that you haven't been to yet?